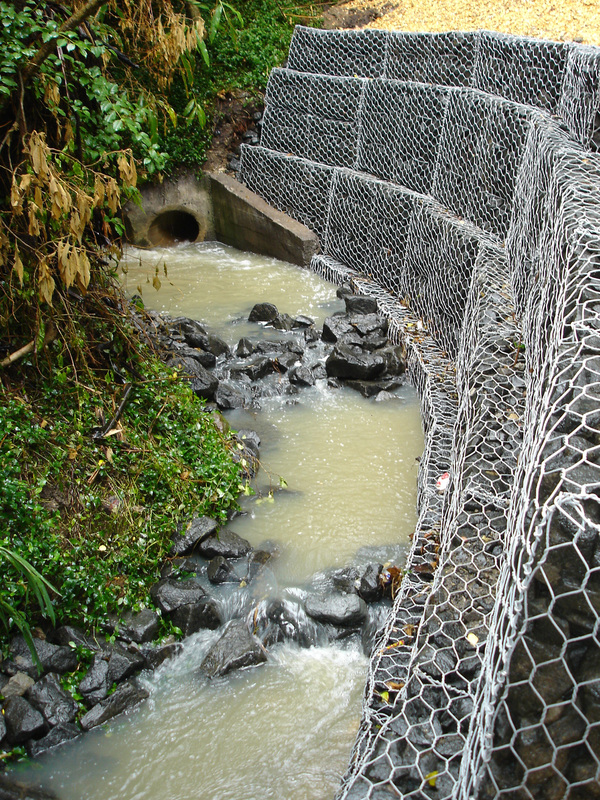 A gabion wall constructed to repair scouring and erosion of the stream bank. The works included difficult site access through private property. Timing of works during dry weather was critical and well planned with a sand-bag stream diversion installed during construction activities. A small 0.8 Tonne digger was craned into the base of the excavation area to break out footings to sand stone base, highlighting our ability to think outside the square. Surplus material was double handled by a second excavator to load out as well as import rock for both the wall and stream weirs. Weirs acting as fish ladders were constructed as part of the works as well as reinstatement planting and footbridge construction downstream. No subcontractors were required in the construction of these works. Time: The project was completed ahead of programme, as such additional works were included downstream from the wall location. A footbridge replacement was included. Budget: The works were completed within agreed budget levels. The initial contract was completed under budget, as such additional works were added to further benefit the overall scope. The additional spend still kept the project budget inside its contingency. Performance levels: All performance criteria were met on the project. Property owners on both sides of the stream were extremely happy with the outcome of the project. All QA criteria were met. The job was completed with no LTI’s or First aid injuries.